U. S. Highway "Route" 66 was commissioned in 1926, the year U. S. numbered highways came into existence. It consisted of a 'collection" of two-lane concrete or asphalt paved roads extending from Chicago to Santa Monica, running through the states of Illinois, Missouri, Kansas, Oklahoma, Texas, New Mexico, Arizona, and California. Route 66 is considered the "Mother Road" of American highways. The old "Main Street of America" was deactivated in 1984 and the U. S. 66 highway shields taken down, after being replaced by the modern interstate highway system. Here is a selected list of Web pages dealing with historic U.S. Highway "Route" 66. Click on the name of the page to access it. If you know of a Route 66 Web page that should be listed here, let me know and I will add it. Cafes, Diners, Restaurants, Nightclubs, Etc. Route 66: Just Another Highway? My Route 66 - Own a Piece of the Road! Getting Kicks on Route 66! Here is a page of links to Web sites about other Highways and Roads. 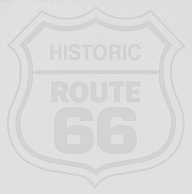 Here is a list of books, maps, and videos about Historic Route 66 that are currently available. Play the song "Route 66" written by Bobby Troup and sung by Nat King Cole. Here are my Route 66 postcards produced for National Postcard Week. "I would rather be driving the Mother Road!" If you know of Web sites that should be listed here, please let me know.